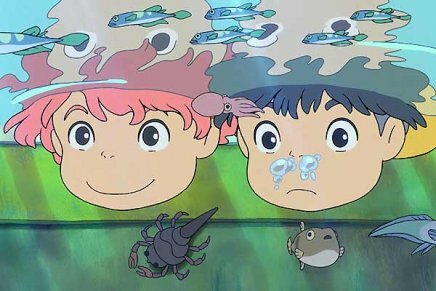 Ponyo tells the tale of Ponyo (obviously), a fish meets a 5-year old boy name Sosuke, and by meeting him longs to get out of the ocean and become a little girl. She gets her wish, but the balance is messed up and chaos ensues. Straight forward fairy tale stuff complete with a wizard father, a goddess mother, and lots of magical happenings. However, unlike standard Disney-fare (and as stated before though) there was really no antagonist in the whole movie. The “evil” father, was just trying to look after his kid and protect the ocean, no harm there. The dramatic tension was created not by an “evil” force, but by pure emotion. The dialogue was not super cheesed up all the time (there were parts though) and the relationship between Sosuke and his mother Lisa (BTW, Tina Fey did an outstanding voice acting job for the English dub) felt genuine and real. Of course, there are always minor things to nitpick at, I mean, if you see a mysteriously little girl in amidst a huge typhoon that your son claims to be his old goldfish, I don’t think I would necessarily take her in without question. The animation, which was in glorious old school 2-D, complete with water color backgrounds, was beautiful. Which is always the case for a Miyazaki film. I like the muted pastels and almost crayon look that the town had. And that huge storm was one of the better storm sequences I have seen in an animated flick. The real magic came in how all these elements came together. Add up the drama, the look, the style, the animation, and slight twist on a common fairy tale, and I was captivated to the screen. I felt like I was 8 years old again. Now some folks weren’t too big on this film and I understand why. Because the last couple of Miyazaki’s movies, Howl’s Moving Castle, Sprited Away, Princess Mononoke, were epic and grand in scale and had more of a concrete political context, some folks were expecting a movie on that same scale. 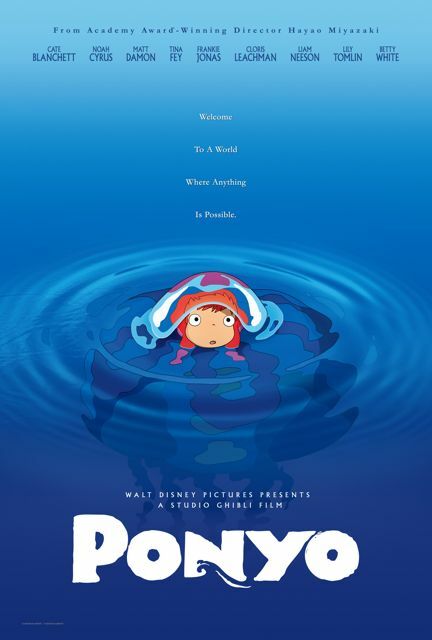 Ponyo is NOT a great epic. There is no overlying political message, save a for a subtle environmental one.This was a movie for kids. This was a movie for adults who wanted to feel like kids again, and you had to be prepared to go back into that state of mind. < I Ain’t Done With You Just Yet….